If you lose a tooth or know you will, finding a prompt replacement should be at the top of your to-do list. Especially if you are on the brink of having a failing tooth extracted, it’s a perfect time to plan. When evaluating your options in tooth replacement, remember that there is no better method than with dental implants in Boulder, CO at Arapahoe Dental. A whole-tooth solution, the dental implant gives you back your missing tooth as well as the root that supports it. Dr Harwood provides dental implant care at Arapahoe Dental. Learn more about the premiere option in tooth replacement today! 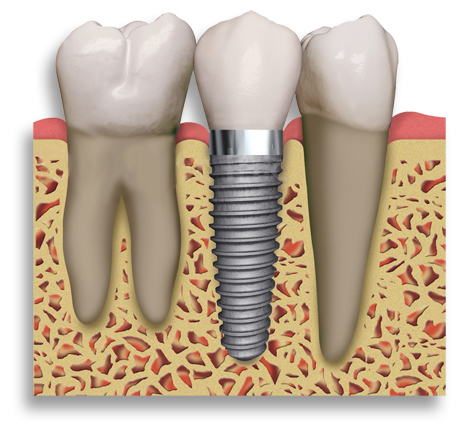 The dental implant is a small titanium screw that holds a prosthetic tooth (a crown, bridge, or removable denture). The dental implant is surgically placed into the space left by the missing tooth’s root. Over time the implant gradually grows together with the jawbone in the process known as osseointegration. The fusion between bone and implants takes a few months. Once the dental implant is completely stable, it is ready to be restored which is the process in which the prosthetic tooth is affixed on top. Sure, other tooth replacement options, like a fixed bridge or non-implant retained denture, usually cost less and are completed faster than dental implants. But life is too long to live with an ill-fitting, uncomfortable set of teeth. Dental implants fit like they should from day one, and can last for a lifetime with proper maintenance. Also, unlike a fixed bridge an implant cannot get decay risking the neighboring teeth. Jawbone stabilization to have a stronger jaw. Dental implants very closely mimic natural tooth structure. Tooth replacement fits properly from day one. No need for denture adhesives. Dental implants are completed in two phases — surgical implantation and final restoration. Many dentists refer patients to an oral surgeon for the initial surgery, but at Arapahoe Dental, your dentist on Arapahoe and Folsom performs the entire procedure from the comfort of our state-of-the-art office. If your tooth loss is recent and you are in good overall health, chances are good you can enjoy from the many benefits of implant dentistry. Discuss your candidacy for the replacement with Dr. Paylor or Dr. Harwood. Patients who have dealt with their missing teeth for many years will likely need to undergo a bone grafting procedure before beginning with their dental implants. Tooth loss causes the jawbone to shrink — but dental implants require plenty of supporting bone structure for proper anchoring. Bone augmentation adds weeks to the total treatment time for dental implants, but helps previously ineligible patients enjoy the benefits of a comprehensive tooth replacement. You deserve to enjoy a complete, beautiful, fully-functioning smile. Dental implants give your smile a second chance after tooth loss! Request an Appointment with your dentist in Boulder, CO to discuss whether or not you are eligible for implant dentistry.